Galway East Tourism - Claregalway Hotel in East Galway, West of Ireland.Galway East Tourism - Claregalway Hotel in East Galway, West of Ireland. The Claregalway Hotel stands proud in the village of Claregalway, just six miles from Galway City Centre. The Claregalway Hotel is a unique destination. The Hotel is ?Definitely Different?, with an innovative, contemporary design, offering an indulgent experience in an interesting and energetic atmosphere. 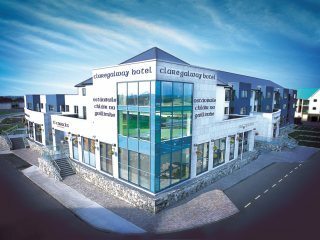 The Claregalway Hotel is a modern, family run hotel, offering the highest standards in accommodation, Leisure Club and Spa facilities, Food and Beverage experiences, Conference and Banqueting services. We specialize in delivering to the customer an opportunity to experience the cultured, vibrant Ireland, whilst delivering on our high levels of hospitality and service. The Claregalway Hotel stands proud in the village of Claregalway on the edge of Galway City. The hotel is the nearest hotel to Galway Regional Airport (2.5km). We boast 48 spacious and luxurious rooms. Each room contains all modern facilities including Plasma Screen TV?s, Wifi Internet access, ISDN lines, and Tea & Coffee facilities. Our fully equipped Leisure Club and Spa Suites provides an 18 meter deck level Swimming Pool, air conditioned Gymnasium and Life Style Studio. You can relax and unwind in our Jacuzzi, Steam Room, Sauna, Spa treatment rooms and Sea Weed Baths. Our Restaurant which seats 180 diners is highly acclaimed locally for its truly exceptional experience, combining delicious modern Irish cuisine with International influences. Ti Cusacks Cafe Bar invites you to relax unwind and enjoy a drink in company of locals, friends and guests. Claregalway Hotel has captured the hearts of many couples since opening its doors in July 2004. Ideally located on the edge of Galway City, Claregalway Hotel has quickly established itself as a leading wedding venue in Galway. The hotel wishes to create a unique experience for the bride & groom and wedding guests alike. Every couple wants their wedding day to be special and the Clare Galway Hotel believe in tailoring your wedding reception to your needs, thus ensuring your every desire is met. We offer fully equipped Meeting Rooms, State of the art Conference and Banqueting facilities. Our rooms vary in size and can comfortably accommodate Meetings or Conferences from two to four hundred delegates. Discover our little hidden secrets that make us definitely different in our contemporary and unique atmosphere where we love what we do.